During this time of year it is vital to take extra care when operating your tractor on and off road. Statistics show that tractors and machinery are the main causes of farm accidents in Ireland. The fatality rate in agriculture is far higher than any other sector. Tractors nowadays have become increasingly larger in size and much faster in speed making them more dangerous for drivers, especially inexperienced drivers. The vast majority of accidents occur when using a tractor on its own firstly and secondly when attaching or using it with other implements. 1) Daily Checks: It is always important to carry out daily checks on your tractor before you drive it to ensure everything is in working order. Make sure the tractor is in safe operating condition. Check the lights are working, keep steps clean at all times for access and check the PTO and lift arm controls. 2) Safe Stop Procedure: Always practice the Safe Stop procedure. Cut back the throttle in good time, wait until the tractor has slowed down sufficiently, press clutch pedal, apply brakes gradually, always park in a suitable location, stop the engine and apply the handbrake, lower all hydraulically mounted equipment and finally remove the key. 3) Safe Tractor Position Method: Carry out the Safe Tractor Position Method. When getting in and out of the tractor always use access steps and hand supports, adjust seat position to operate controls comfortably and adjust mirror for clear view. 4) Keep tractor clear of hazards: Always keep floors, doors, pedals clear and keep your boots clean. Do not keep items like tools, draw bar pins, ropes etc on the cab floor as these cause easy distraction when driving and can cause accidents. 5) Be aware off all blind spots: When driving ensure that there is nobody near you before starting the engine, always watch out for people, obstacles and blind spots. Take time to clean windows and mirrors for visibility and always check that the brakes are locked together. 6) Take your time and be aware: When driving never move the tractor off until you are fully aware of how all controls operate and where they are. Take your time and never rush when operating the tractor. Use throttle-correct procedure for slowing down, when reversing use mirrors and use the horn to warn by-standers. Lower your gears gradually when preparing to stop. 7) Use the correct hitch system: When hitching always make sure you use the right hitch system. Only use the controls from tractor seat and never stand between tractor and other machines or behind them. Never stand with your feet under or near draw bars and ensure that jacks, skids and other supports are used and maintained. 8) Experience is necessary when handling the tractor: It is advisable to have inexperienced people supervised when hitching and unhitching trailers and implements. Never get between a hydraulically mounted machine and the tractor or place your feet under parts that can collapse e.g. a drawbar. 9) Always check the terrain: When in the tractor and carrying out work always make sure the terrain over which the tractor is driven is free from hazards such as steep slopes or excavations. 10) Beware of danger from overhead lines: Tractors or machinery should never be operated if a danger from overhead electricity lines exist. 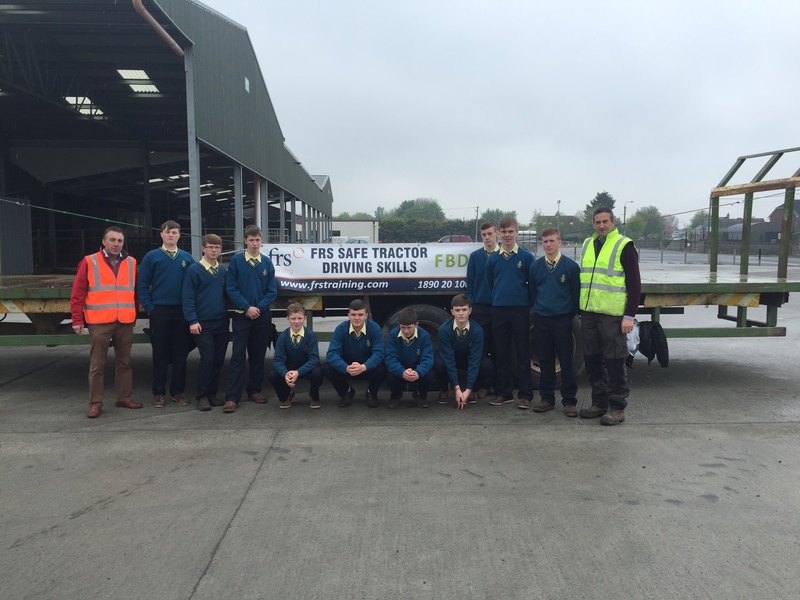 FRS Training are currently running a Safe Tractor Driving Skills Course which is sponsored by FBD trust. The course has proven extremely popular over the years with groups especially secondary schools throughout the country. The main focus of the course is to teach young people how to operate and drive a tractor safely, with practical instruction being a key component of the training. The course covers PTO shaft safety, safe tractor control procedures, trailed equipment and safe tractor operations, and brings the awareness of safety back to the farm. The third annual Embrace FARM Remembrance Service will be held on Sunday June 26 in the church of The Most Holy Rosary in Abbeyleix. Embrace FARM was founded in 2014 to provide a bereavement support group for farm families who have lost a loved one or suffered serious injury in a farming accident. Visit www.embracefarm.com for more information. Contact FRS Training on 1890 20 1000 and visit www.frstraining.com for more information on Farm Safety courses.